M.I. Cement Factory Ltd. started its journey with the aim of fulfilling the demand of cement in the country. M.I. Cement Factory Ltd. reached that target successfully by producing 2800 MT of cement per day. But we would like to give all the credit of success to our customers. We are thankful to our customers for their confidence on the Crown Cement. Now more than 50 brands of cement are sold in the market. Customers’ confidence led us to bring Crown Cement to the Customers abroad. We are the first to include the cement in the list of export commodities. For this success we are thankful to the skilled workforce of M.I. Cement Factory Ltd. They have been making tireless efforts to reach the quality cement to the customers. We also seek cooperation from customers in our progress. M.I. Cement Factory Ltd. believes in quality production and good services to the nation. From my long experience in cement trade, about four decades, I felt the need for quality cement for our country. It inspired me to set up a cement factory, which can cater to the need for desired quality of cement. We take care of procuring raw materials, production procedure; packing materials and keeping vigilance through our well equipped laboratory that secure high quality cement. Our management is apt to satisfy our customers by quality product and services. Satisfying the home users ‘Crown Cement’ has now won the heart of the customers abroad. We are the country’s first proud exporter of cement, and the product has been received with dignity for its high quality. This is the pride of our country, pride of our nation and also pride of our M.I family. We congratulate our valued customers patrons and staff. From my long experience in cement trade, about four decades, I felt the need for quality cement for our country. It inspired me to set up a cement factory, which can cater to the need for desired quality of cement. We take care of procuring raw materials, production procedure; packing materials and keeping vigilance through our well equipped laboratory that secure high quality cement. Our management is apt to satisfy our customers by quality product and services. Satisfying the home users ‘Crown Cement’ has now won the heart of the customers abroad. We are the country & rsquo;s first proud exporter of cement, where the product has been received with dignity for its high quality. This is the pride of our country, pride of our nation and also pride of our M.I family. Before starting up M.I. Cement Factory Ltd. we were in the arena of construction material business for more than four decades. Our business was run on importance of construction materials including Portland cement. We used to meet the requirement of our valued customers through import of cement. It was very time consuming as well as costly. Moreover there was always a high change of deterioration to properties of cement in view of long transit time to reach. This has backed up us to give a serious thought to establish a cement factory and to cater the need of quality cement countrywide.With the establishment of M.I. Cement Factory Ltd. we have been able to save and directly contribute about 500 million in local currency to the national exchequer. Moreover we have been also able to bring reduction in the price structure with supply of fresh product and creation of employment opportunity. We give highest importance for procurement of quality raw materials. We always get the sample from the intending suppliers/manufacturers for carrying our various tests to find out quality and acceptability. This we do to see that low graded materials are not procured. We maintain our production process state of art machineries. Proper maintenance to the mechanical and electrical equipment are made regularly. We never compromise with the quality. We are maintaining a very sophisticated and well equipped laboratory to carry out quality test. It is our standing instruction to conduct various quality tests within the production process. The product is only air marked to put to market after same being fully passed by the quality control department upon their full satisfaction. Our product is analyzed and tested by BUET, LGED, etc. apart from our own laboratory test to ensure quality before the cement is being put into market. By now we have passed years since we completed establishment of cement plant and went for commercial production. Within these short span of time we were able to produce millions of bags of cement and market those to the satisfaction of our valued customers. We have great reliance on our valued customers countrywide. It is our only aim to supply quality cement at a reasonable rate to our numerous users for years to come with our endless effort for the development of the country. 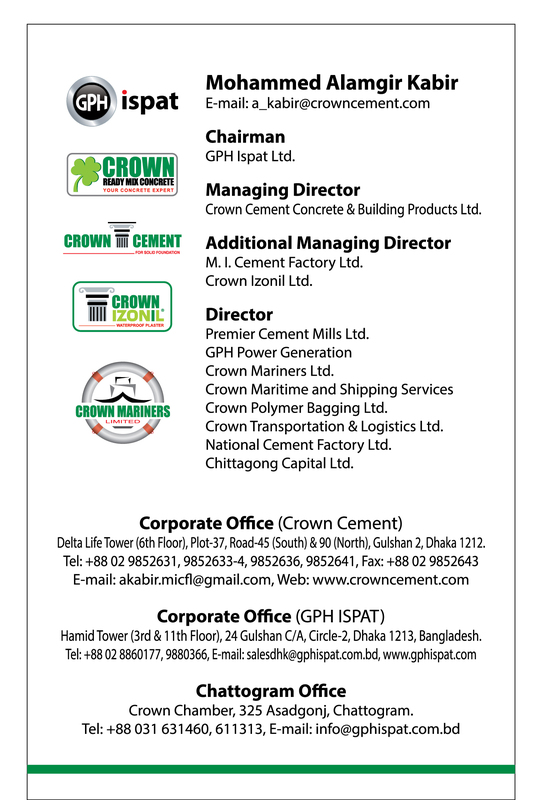 The marketing policies of Crown cement have been pursued by considering its customers demands and satisfaction. The demand of quality cement is being increased gradually in different construction works in home and abroad. That is why the combination of high quality of raw materials, use of most modern technology and weather-friendly packing system is being made in every bag of our Crown cement. Our department is pledged-bound to give the facilities of speedy shipment of cement to different corners of home and abroad by road and by river. In addition to this we are also promise-bound to give other cement-related services. We hope that we will get continued cooperation from our valued dealers, retailers and buyers and this will help us upload the progress of Crown cement.